Take Twitter. Even if a new person somehow ends up finding a tweet you posted about your music by accident, they’re at work or at home about to overcook dinner. Even if they see your link, click it and listen to your music, they’re probably gonna’ be like “That’s cool… but I really should get back to Twitter to see what Martha Stewart ate for lunch.” and forget all about you. The “conversion rate” (converting people who see or hear your music into someone who adds or follows your music) is so comically low for this very reason. You’re basically interrupting them. They’re not looking for new music on Twitter. Don’t believe me? 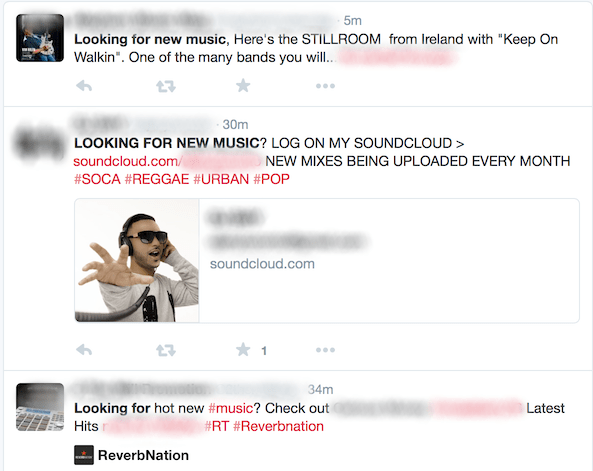 A search on Twitter for “looking for new music” doesn’t show people looking for music, it shows a bunch of “music makers”, all desperate to get people to listen to their music. People look for new music when they’re in their music app. This means they’re in Spotify or Apple Music… not Twitter, Facebook or even SoundCloud. All major streaming platforms focus on discovering new music. “Great! I have new music!” you say to yourself. Yeah, no… you ain’t invited. “But I do have my music on Spotify!” Yeah, no, you still ain’t invited. This is what’s bad about the current scene; it feels like new music is around us at all times. It has to be; new, stupid lookin’ “artists” barely out of puberty become over-night sensations all the time. But they’re not being “discovered” by fans, they’re being “discovered” by marketing agencies who’s job it is to spend hundreds of thousands of dollars into making them the next overnight sensation. Take the acid jazz artist Mr. Scruff, who’s been around for years and years. He’s got tons of fans, which he’s cultivated over time through many albums and many tours. The “followers” he has on platforms like Spotify isn’t the important metric to focus on; it’s his monthly listeners. Currently, he has 254,242 listeners. That’s the metric that matters. (I don’t even have one percent of that on Spotify, hint hint.) We’ll create a new, fake acid jazz artist called… Mr. Joe Blow. Here, with proper promotion (including crap loads of money thrown at the “taste makers” in music communities in the form of secret kickbacks), marketing agencies can get a new acid jazz artist up to somewhere close to the monthly listeners of Mr. Scruff. You might think that, if you get an unknown artist that many monthly listeners through a blitz effort, then all those individual listeners will convert into fans. No… if this Mr. Joe Blow artist has 250,000 listeners in one month from this blitz promotion, his numbers will likely drop to 50,000 month two, 15,000 month three and finally probably rest at between 2,000 to 10,000 monthly listeners. Even if people enjoy his music, it’s so hard now-a-days to convert people info fans. Music marketing agencies know that, by getting Mr. Joe Blow up to that many followers just in one month, they’re gaming the system. Spotify and Apple Music both are trying to focus on “up and coming” new talent. Each platform wants to be credited with discovering new, rising artists first. Both platforms want to be seen as “helping new artists” as it looks good via a marketing stand point against competing online music services. So, streaming music platforms, such as Spotify, its algorithms see a massive influx of monthly listeners for an artist. These platforms know what type of music we all listen to. Easy for these systems to correlate common music tastes of the monthly listeners for Mr. Joe Blow (acid jazz artists). 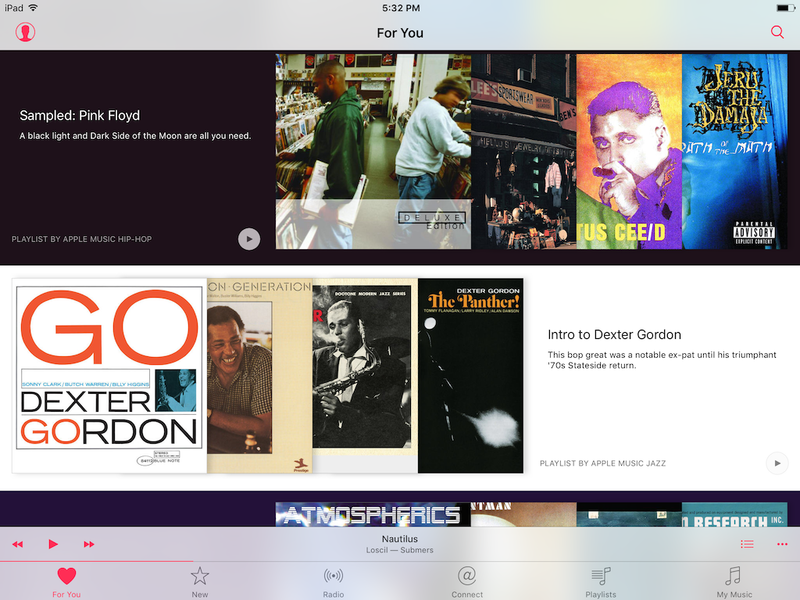 It does this by examining the few people who did follow or added his songs to a playlist and finds a common trend in related artists (in this case, major acid jazz artists). Here’s where the magic (gaming) happens; Mr. Joe Blow, a virtual nobody with mediocre music not even up to the quality of people like Mr. Scruff, suddenly starts appearing on Spotify’s “Discover Weekly” or Apple Music’s “For You”. Mr. Joe Blow, someone who hasn’t even been active for more than two months, suddenly starts becoming a “recommended artist” for Mr. Scruff and other major acid jazz artists. Suddenly, people who are actually looking for new music, such as through the discover now feature or looking at related artists, are now seeing Mr. Joe Blow. The absolute, pristine moment new fans are looking for new music is the very moment Mr. Joe Blow is now in front of all these perfect new fans. Overnight, this virtual nobody with unimpressive music is now on the same leagues as Mr. Scruff. This has been happening before for decades and decades. Music promotion article writers and other starry-eyed hopefuls all think we’re entering a new age without pay-for-play and having situations where new artists can get discovered in ways like never before; it’s BS. Don’t believe me? Look no further than a virtual nobody, with only two songs, who has become an overnight sensation… Lana Del Rey. No, nothing fishy here about this internet sensation.